For the sauce:Add two tablespoons of olive oil to a medium-sized saucepan at low heat. Then, add the onion and cook for 5 minutes then add the garlic and Moroccan seasoning, stir until everything is well mixed. Add the tomatoes and cook for 20 minutes until the sauce thickens. Add the sea salt. For the pizza: Preheat the oven to 500° F.
Spread 1 tablespoon of olive oil on a pizza-baking dish and extend the dough to cover the surface. Spread olive oil over the pizza with a silicone kitchen brush. Bake for 10 minutes or until it browns. While the dough cooks, add 2 tablespoons of olive oil to a saucepan over medium heat. Add the eggplant, cumin, sea salt and cook until the eggplant is soft, about 10 minutes. Add the chopped garlic and cook about 5 more minutes. Add another tablespoon of olive oil to a small saucepan and cook over low heat. Add the red onion and stir constantly until it becomes transparent for about 10-15 minutes. Lower the temperature for 450° F.
Place the prepared tomato sauce over the cooked pizza dough and leave a one-inch crust without sauce. Spread the mozzarella, the eggplant mixture and the onions over the pizza. Then sprinkle the olives, dry tomatoes and feta cheese, harmoniously. Use the brush to spread the olive oil to the crust of the pizza that was left without sauce. Place the pizza back in the oven for 15 minutes or until the mozzarella has melted. Remove from the oven and place a few fresh mint leaves on top. To save time in the kitchen use store bought dough that comes ready to unroll. Add your favorite ingredients and bake. Use a silicone brush to apply the olive oil, this way you avoid having the bristles from a regular brush sticking to the pizza. If you prefer crunchier crust, place the pizza directly on the rack of the oven and don't use a tray. Carefully remove from the oven using a large spatula. At one point or another, I'm sure I've commented that I'm a huge sports fan. As a student I participated in basketball, volleyball, kickball and track and field in college. I was always among the best athletes. Besides being athletic, I've always been very emotional as the feelings flow out of me with every game that I watch, and I really enjoy it. I try to calm myself with my favorite pastime: cooking. This way I enjoy a good match, channeling the emotions like sadness, anxiety or euphoria that the games cause into my cooking. When I'm overwhelmed with sadness because my team isn't winning, I'm taken by a craving for Greek pizza. Though you may not believe it, I relate it with the music from the movie Zorba the Greek from the 60's. This wonderful instrumental (that ended up being the more important than the actual movie) starts off slow and sad and slowly builds up to a faster rhythm, bringing joy and the urge to dance in circles. 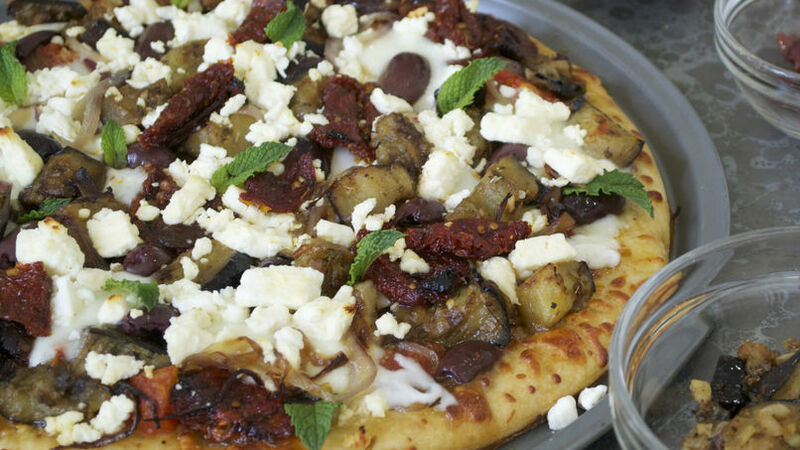 When I prepare this Greek pizza, I feel I am honoring Greece, a country that I have yet to visit, though I know one day I will. I admire the history, culture and gastronomy of this ancient country. The exotic mixture of ingredients, seasoning and flavor always lifts my mood. You too can enjoy this delicious pizza and drown your sorrows in the Mediterranean.